Hazelwood Luxury King Quilt Set by VHC Brands - P.C. Fallon Co. The Hazelwood Luxury King Quilt Set updates the color palette of the Ninepatch Star pattern to black, mustard, and crimson for a new look. 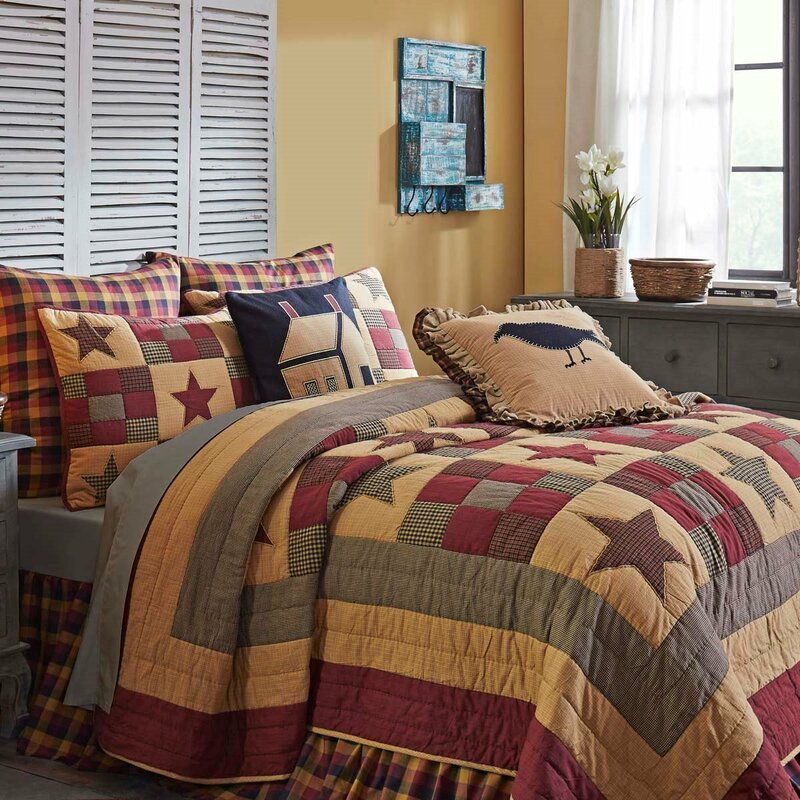 The patchwork quilt has alternating diagonal rows of 5-point stars and ninepatch blocks in plaid and check fabrics. Framing the quilt are three borders in black, mustard, and crimson plaid fabrics. The edges are trimmed in mustard plaid binding. The back of the quilt is a mustard plaid fabric. Done in stitch in the ditch, channel, and echo hand quilting. Machine pieced. The sham is a smaller version of the stars and nine patch blocks in stitch in the ditch and echo hand-quilting trimmed in crimson plaid binding. The sham reverses to the crimson plaid and has 3 tie closures. Set includes the quilt 105"L x 120"W and 2 shams 21"H x 37"W. 100% cotton shell and batting. Machine wash gentle. Do not tumble dry. Do not dry clean. This item is imported. Please note, colors may appear differently in different resolutions and on different computers. Manufacturer UPC code 840528161384 .